Intel's Core i7-3820 processor was recently released on February 12th. Some of you might be wondering if this cheaper version of the Sandy Bridge-E processors is a better value or option to something like the i7 2700k processor. We'll do our best to outline what this processor brings to the table and then we’ll benchmark the processor to see how it stacks up against alternative processors you might be considering for your next build. 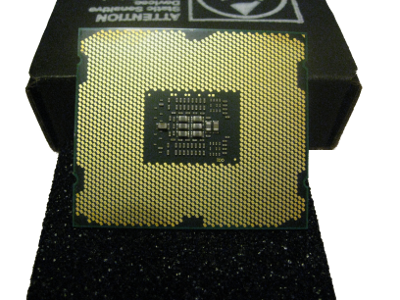 Previously Intel released two SB-E processors: the Core i7-3960x, and the Core i7-3930k. The current price for each of these is roughly $1,049 and $599 respectively. At those prices, they are definitely targeted for those with deep pockets and a need for the extreme. With the recent addition to their SB-E lineup the Core i7-3820 can be picked up for about $309. At roughly half the price of the mid range SB-E you have to wonder what Intel has done to make this one so cheap. 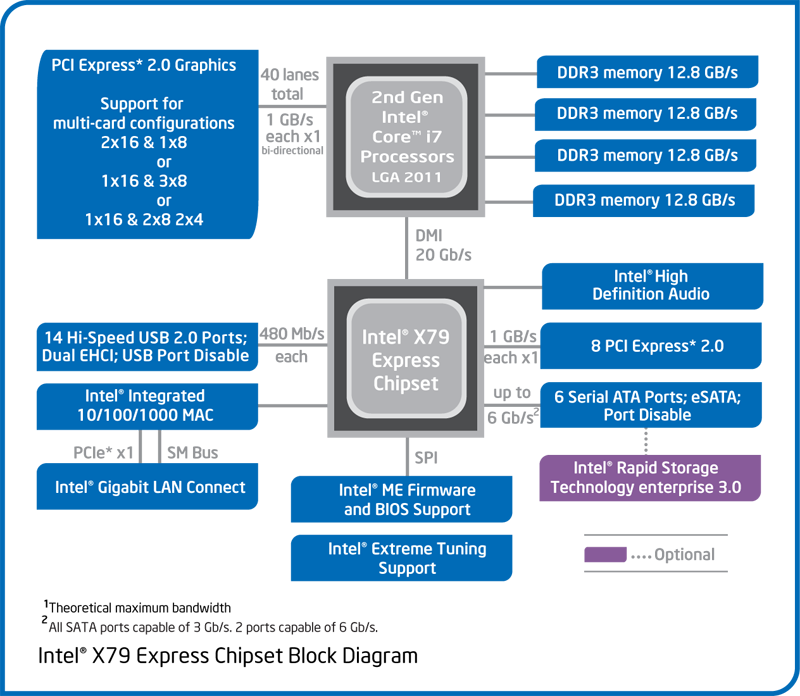 Here is a table that compares some of the specs for the SB-E processors. The first thing you might notice is the base clock speed being slightly higher while the max turbo speed is right on par with the other two. Probably one of the most significant difference is the number of cores. The i7-3820 comes with 4 cores rather than the 6 cores we’ve seen in the other two SB-E processors. The L3 cache is slightly lower though it still has a large amount of cache. The chart does not mention anything about Integrated graphics. With the introduction of Intel’s second generation i3/i5/i7 processors they came with an integrated GPU. None of the SB-E processors have integrated graphics; however we would like to point out that the SB-E processors are targeted towards enthusiasts who will most likely want dedicated graphics cards anyway. As an enthusiast myself I must say that I would rather see Intel put the money towards better, faster and more feature rich CPU’s than to put it towards integrating a GPU that I would never use. The last thing we would like to point out has to do with Intel’s naming convention and its significance to the Core i7-3820. 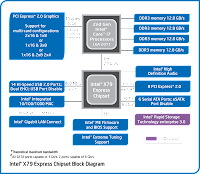 Processors that end with x are part of Intel’s extreme lineup which means that they have unlocked multipliers. The k suffix is indicative of their mid range processors but they still have unlocked multipliers. The i7-3820 does not end in a k or an x which means that it unfortunately does not have an unlocked multiplier. For those of you that are unfamiliar with Intel’s production model we would like to cover what they call the Tick-Tock model. 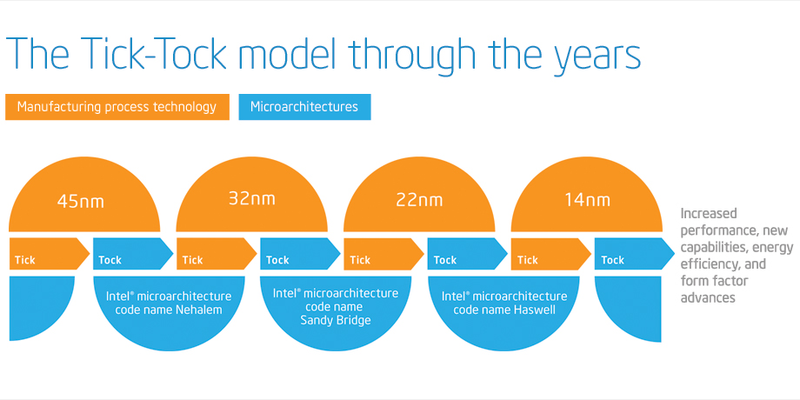 Intel designs their processors in what they call the tick-tock model where the tick is representative of manufacturing process technology while the tock is representative of improved microarchitecture. The Sandy Bridge-E processors are part of the tock, so they have improved microarchitecture over the previous Westmere processors but they are still on the 32 nm fabrication process. When deciding what hardware to include in your next computer it is important to identify the features you are most interested in. People ask me all the time, “What’s the best processor”. I usually follow up their question asking them what they are looking for in a computer. Most people just want a quick answer, but the unfortunate truth is it’s more complicated than that. The X79 chipset motherboards should include PCI Express 3.0. The improvement over PCI Express 2.0 is roughly twice the speed. PCIe 2.0 was capable of 500 MB/s on each lane. So on a x16 PCIe slot it is capable of transfer speeds up to 8 GB/s in each direction. PCI Express 3.0 doubles that speed bringing it to an amazing 16 GB/s each way to total 32 GB/s of bi-directional transfer speeds. This feature will definitely leave the doors open as SSD’s increase in speed and graphics cards provide more processing power. Another major improvement to PCI Express with SB-E processors is the number of PCIe lanes. Sandy Bridge-E processors support up to 40 lanes. This gives you the possibility of two x16 slots for running in SLI/Crossfire with one x8 slot or however you chose to configure your 40 PCI Express lanes. Quad-channel memory certainly sounds cool. In the past we’ve seen dual channel setups and then triple-channel memory configurations. Sandy Bridge went back to dual channel memory while Sandy Bridge-E bumped it up to quad-channel memory. It will be interesting to see how quad-channel memory performs in our benchmarks compared to dual-channel and triple-channel memory configurations. Another feature to consider is the amount of L3 cache on the chip. Both the i7-2600k and the i7-2700k have 8 MB of L3 cache while the i7-3820 comes with 10 MB. L3 cache plays an important role in the performance of the processor. To test out our brand new Core i7-3820 processor we'll be using the ASUS P9X79 Deluxe motherboard. We have 32 GB of quad-channel Kingston HyperX Genesis 1600MHz memory. We're using a 240 GB Corsair Force GT SSD. The graphics card is an EVGA nVidia GTX 470. We could have gone a little more extreme on the graphics card, but our primary focus is on the CPU. To power this rig we've got an Antec High Current Gamer M 620 watt power supply. 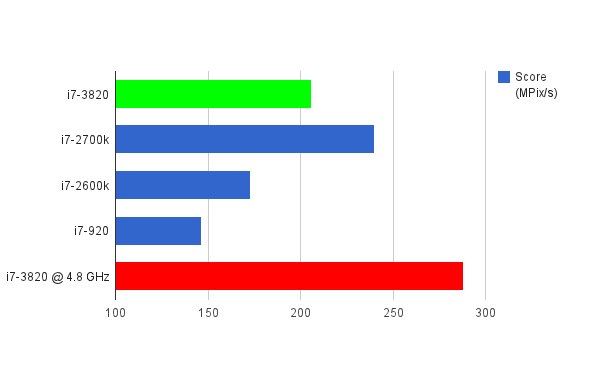 The i7-3820 outperforms the other processors with the i7-2600k surprisingly not far behind. The overclocked i7-3820 without saying blows the others out of the water. 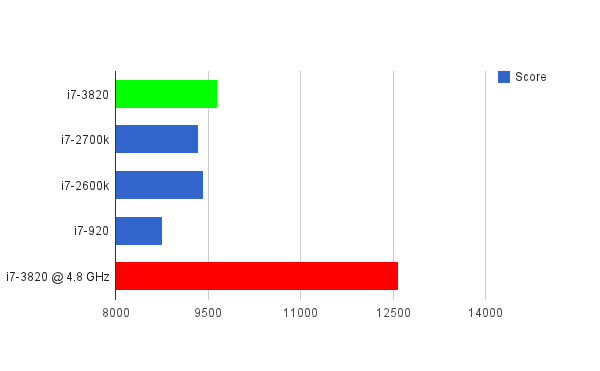 The i7-3820 comes in second but falls behind the i7-2600k in our SSE benchmark. The i7-2700k is also not far behind the i7-3820. Even more interesting on this benchmark is how the i7-3820 @ 4.8 GHz does only marginally better than the i7-2600k here but note its significant jump from the standard clock speed. For some reason the i7-2600k does really well in the compression test with PassMark. What’s really impressive is the jump in compression you get with an overclocked i7-3820. With a processor that is so willing to be overclocked it was very easy to get some significant improvements in the benchmarking results. 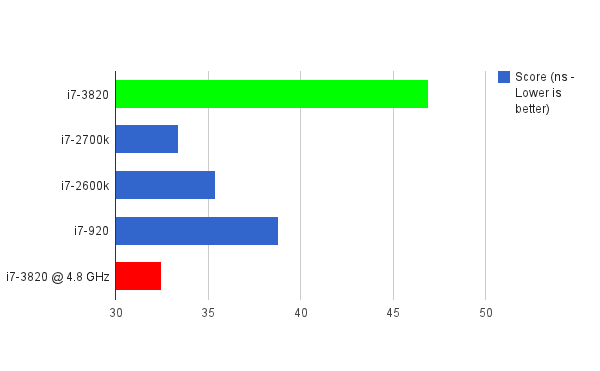 Here is the overall score for the CPU Mark test. 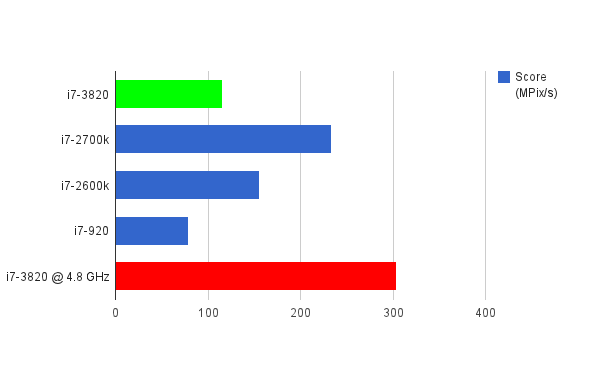 We can see that the i7-3820 manages to pull out ahead of the other processors but as you can see, the gap is not as large as what you see from 1st gen i7 to 2nd gen i7. The overclocked i7-3820 really shines. The i7-3820 doesn’t do as well in this benchmark. It takes the lead in Inter-Core Bandwidth, but falls behind in the Inter-Core Latency test, taking longer than any of the other three processors. However, as you might have expected the overclocked i7-3820 manages to take the cake. Intel’s i7-2700k outperforms all the standard clocked processors in this benchmark. 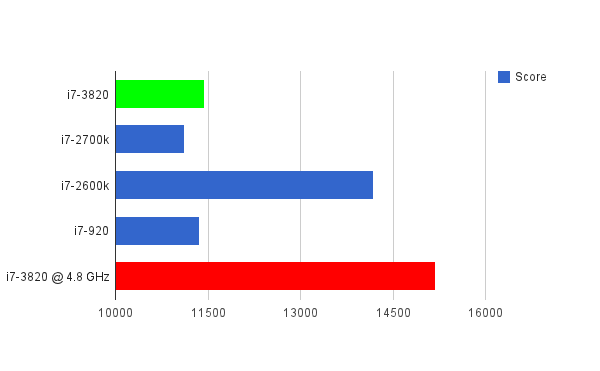 The i7-3820 does better with integers here, but falls behind even the i7-2600k in the Float/Double Native benchmark. As we saw with the other benchmarks the overclocked i7-3820 wins again. Our results leave us somewhat at a crossroad. It's difficult to say definitively if the Core i7-2700k or the Core i7-3820 is a better processor. The i7-3820 is certainly less expensive than the other Sandy Bridge-E processors, but there are additional expenses to consider for any SB-E setup. The motherboards are generally more expensive and so are the coolers. 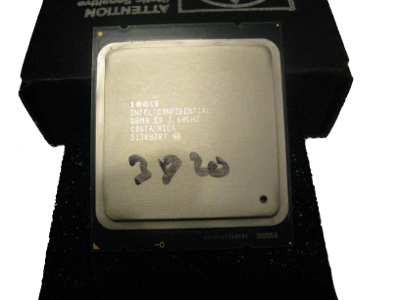 If price is a concern, then you might want to turn to the i7-2700k. If you care about having an integrated GPU then you should go with the i7-2700k. If you want/need 40 PCI Express lanes then the i7-3820 is the way to go. If you want the extra memory bandwidth then you should consider the i7-3820. If you are looking for a setup that can stand the test of time (keep in mind we're talking about computers here) then the i7-3820 is probably a better choice. If we’ve learned anything from this benchmark it is that the i7-3820 certainly leaves plenty of room for overclocking. We would like to point out that this was all accomplished with air cooling. At a maximum load over several minutes, we were averaging a CPU temperature of 64 degrees Celsius. If you’re looking for a processor to overclock then this is definitely a good choice. We mentioned earlier that building a computer boils down to features. This processor is no exception to that rule. 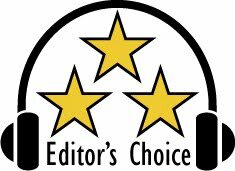 For the features it offers and at the price point of roughly $300 we are giving this our Editor’s Choice award. You will definitely not be disappointed with this processor. It delivers in every single way you would expect from a high end processor. The opening words, "All Aboard" from the classic Ozzy Osbourne song Crazy Train keeps coming to mind. It's March Madness time, and things get pretty crazy. And that means here at Stereowise Plus it is also time for our annual Headphone Shootout. It is time for headphone manufacturers to start duking it out. This years contenders come from AKG, Altec Lansing, AudioFly, Audio-Technica, Eers, German Maestro, The House Of Marly, Monster, Sennheiser, and V-Moda. The shootout will be in two parts, as usual. The first one will be over/on the ear, and the second part will be IEMs (In Ear Monitors). Basketball teams are judged by their offense, defense, players, and the points they get on the board. The Headphone Shootout will be looking at features and design, specs, quality, and performance. And instead of brackets, we have price points that range from $80 to $1,000. Listening tests will be from bottom to top, one song at a time. 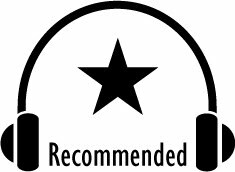 For a good variety of songs, I have used Steve Miller Band: Swingtown, Metallica: Nothing Else Matters, Pussycat Dolls: Don't Cha, Brunson Brothers: Fleace Movae, and Eric Kunzel: Sing, Sing, Sing. We will now be starting with part one. Let the shootout begin! We will start with the AKG K451. They are a small attractive looking pair of headphones. They are small portable fold-up design with a nice hard zipper case. It comprises of the headphones, case and two pair of detachable cables, and manual. One cable is a standard cable, and the other has in-line mic and control buttons. * Remote control and microphone supported by iPod nano(4th generation and later), iPod classic (120GB/160GB), iPod touch (2ndgeneration and later), iPhone 3GS, iPhone 4, iPad and iPad 2. Remote control supported by iPod shuffle (3rd generation and later). May require latest software version on device. They came in an attractive looking box. The build quality appears good, as well as the fit and finish. I like the fact that the cables are detachable. The earcups are very soft, and feels comfortable on the ears. The cables also have a nice soft feel to them, and the tips are gold plated. Likewise the hard zipper case is custom molded on one side to fit the headphones folded up. The other side has two mesh pockets to hold the cables. Listening to Steve Miller Band: Swingtown, there was decent punch to the kick drum. The vocals were natural sounding, and the highs were fairly crisp. Metallica: Nothing Else Matters had ok resolution in the acoustic guitar. It was fairly crisp sounding, with smooth vocals. For small portable headphones, they had good bass extension. Pussycat Dolls: Don't Cha was pleasantly dynamic, with crisp percussion. The bass while it didn't play with a lot of authority, did play deep. Brunson Brothers: Fleace Movae showed fairly clean trumpets with good resolution. And Eric Kenzel: Sing, Sing, Sing provided a nice sound with ok resolution. The clarinet solo was clean, with nice output from the tympani. There was a good sized soundstage with good imaging. The trumpet solo was also clean, with good pitch definition in the trombones. Next up is the Audio-Technica ATH-ANC7b. These are actually an active noise cancelling pair of headphones. The earpads swivel to fit in a zippered hard case. There is a small metal mesh covered opening on each side that appears to hold a microphone for the active noise cancelling function. One earpad has an on/off button for the noise cancelling feature, and the other earpad holds a single AAA battery to power them. They use a fairly simple swivel design for the earpads for portability in the included case. They are mostly plastic, but feels well put together in your hands. Quality of materials as well as fit and finish is also good. The earpads are large enough where my ears were able to fit inside them, and they felt comfortable. The hard zipper case also felt fairly well made and durable. And there is a small zippered pouch inside the case that holds the included accessories. These include the 1/4 inch plug, airplane adapter, and detachable cables. I like the fact that it has a detachable cable, and there are actually two with different lengths. Steve Miller Band: Swingtown provided crisp snare drum, natural vocals, and good pitch definition in the drums. The guitars had nice resolution. Metallica: Nothing Else Matters showed crisp acoustic guitar. Vocals were just a tad toned down and not quite as vibrant, and drums sounded good. Pussycat Dolls: Don't Cha had clean highs in the percussion with good resolution, and was fairly dynamic. Vocals were natural sounding, and the bass had good extension with authority. Brunson Brothers: Fleace Movae was clean sounding with ok resolution, nice sounding percussion, and good sounding trumpets. Eric Kenzel: Sing, Sing, Sing was good sounding with nice resolution. The clarinet solo was clean, with good output of the tympani. Imaging and soundstage was also good. The trumpet solo was also clean sounding. As they are also active noise cancelling, I tested that feature as well. I was pleased to see they actually worked as advertised. They advertise 90% noise reduction, and from what I was able to hear 90% appeared right on. Keep in mind that they are designed to reduce engine noise. The constant low end rumble can get fatiguing, whether you travel by plane, train, or bus. These are designed to cut out the low rumble of engine noise. They do not cancel all of the sound around you. So if someone tries to talk to you, you will be able to hear them. An interesting thing is that the active noise cancellation also seemed to act as an amplifier to increase and improve the sound. I thought they sounded not only louder, but better with the active noise cancellation enabled. So in doing the listening tests, they were done with the active noise cancellation turned on. The House of Marley: Stir It Up model is next in line. They have a very cool looking retro look. They used wood in the earcups, cloth around the headband, and the classic Marley look with a black, red, yellow and green cloth cable. The trend continues as the cable is also detachable. It also has in-line mic and controls. -On-ear design for exceptional comfort even during long listening sessions. -15Hz - 22kHz frequency response adds clear sound reproduction. -40-millimeter dynamic moving coil speaker drive for sound reinforcement. -Recyclable aluminum ring that’s high quality, adds to durability and keeps materials out of the waste stream. -52" Fabric Covered Cord helps reduce tangles and is specially engineered to cut down on static so you get that clear sound. I am impressed with the build quality. They feel very sturdy in your hands. The earcups feature black aluminum, wood, and a ring that contains the red, yellow, and green color theme. The earcups swivel for easy storage in the green cloth carry bag. I also like the cloth covered padded headband. Overall fit and finish and quality is very good. They even feature real leather covered earpads. I am sure Bob Marley would have been very pleased with the product. Steve Miller Band: Swingtown had good resolution in the cymbals and guitar. The kick drum had good extension, and vocals were natural. Drums sounded good, but not quite as crisp. Overall the sound was a bit on the warm side. Metallica: Nothing Else Matters had nice resolution in the crisp acoustic guitar. Vocals were smooth and fairly natural sounding. The kick drum had good low end extension but was a tad muddy. Pussycat Dolls: Don't Cha the warmer sound came thru again, as they were not quite as dynamic with the claps/snaps. There was good resolution in the percussion. There was also good bass extension with ok authority. Vocals were also clean. Brunson Brothers: Fleace Movae was clean sounding with good resolution, with a tad warmer sound overall. The trumpets were good sounding with nice bass extension. Eric Kenzel: Sing, Sing, Sing had a nice sound and ok resolution. The clarinet solo sounded very natural and the tympani had great authority. The soundstage was good sized, and the trumpet solo was clean. The HD-25-1 11 Originals from Sennheiser are a nice looking DJ headphone. They sport a blue and black theme. They feature a plastic construction in black plastic, with blue pads on the headband, earpads, and a blue cable. MSRP is $250. My initial thought about the quality is cheap plastic. But upon further handling them, they are actually pretty solid, and seem very durable. As is typical, the fit and finish is good on this Sennheiser product. The earpads slide up and down for an adjustable fit. The headband also splits to a somewhat V pattern for a more secure fit on your head. Unlike the previous models, the cable is not detachable. But it is thick and well made. The plug also is gold plated and threaded to screw on the 1/4 inch adapter. The padded earcups were sufficiently soft, and felt good. Steve Miller Band: Swingtown was not quite as smooth sounding. Resolution was good in the cymbals and kick drum. Vocals were smooth and natural sounding. The guitar also had good resolution and nice harmonics. Metallica: Nothing Else Matters had clean sounding acoustic guitar, nice extension in the kick drum that while it did not have a ton of authority was actually pretty clean. Vocals also had nice pitch definition and harmonics. Pussycat Dolls: Don't Cha didn't appear as dynamic as the snaps/claps were a bit laid back. There was nice high range frequency extension and pitch definition in the triangle. Vocals were clear, and overall the sound was just a tad bright. Bass extension was ok. Brunson Brothers: Fleace Movae was very clean sounding with excellent resolution in the trumpets and snare drum. Bass had sufficient extension, and excellent pitch definition. Eric Kenzel: Sing, Sing, Sing had great sound with very good resolution. The clarinet solo was clean sounding, and the tympani had great output and resolution. Both the soundstage and imaging were good. The trumpet solo was exceptionally clean, with good pitch definition in the trombones. The AKG K550 is a large studio style reference headphone set. The earpads swivel and colors are dark aluminum with some black plastic in the headband. They feature a rather thick single sided cable. MSRP is $300. I like the use of metal in headphones, as they appear to have a more durable feel to them. The quality of materials is very good. Fit and finish is also excellent. The soft ear cups are so large they easily cover my ears. The swivel movement of the earcups is smooth. The headband is mostly aluminum, and is also padded. I really like the markings on each sides of the headband, from 1-10. It makes for easy adjustment for a perfect fit. The thick cable has a premium fit to it. They are comfortable enough for hours of listening at a time, and built well enough to last for years. Steve Miller Band: Swingtown had good resolution in the vocals. The cymbals were crisp, keyboard sounded natural, and there was nice resolution in the guitar. While there was ok low end extension, it did not have a lot of authority. Metallica: Nothing Else Matters was very crisp with the acoustic guitar and was a tad bright. There was nice resolution in the vocals that revealed their timbre. bass extension was there, but without much authority, so they sounded just a bit thin. Pussycat Dolls: Don't Cha had clean and crisp percussion with good resolution. The snaps/claps were sufficiently dynamic. There was very good harmonics in the vocals with good detail in the timbre. Bass extension was good, but without a lot of authority. Brunson Brothers: Fleace Movae was really clean sounding with very good resolution in the trumpets and percussion, and not too bright. Bass extension was ok, and with sufficient authority. Eric Kunzel: Sing, Sing, Sing had great sound with good resolution. The clarinet solo was clean, with good output in the tympani. Both soundstage and imaging were good. The trumpet solo was very clean with great pitch definition in the trombones. Next up is the German Maestro GMP 435 S. For those that know high quality audio may know the name MB Quart. German Maestro is the new company name from the makers of MB Quart. They are an over the ear studio style headphone, with a cable in each earpad. Construction is mostly plastic, and an open back design. They are based on the highly rated GMP 400, but use low-impedance and highly sensitive drivers. This makes them better suited for portable devices, such as MP3 players. MSRP is $320. To be honest, I had high expectations, as I am familiar with their products and history. They are not cheap at an MSRP of $320. My first impression when I pulled them out of the box, I was a bit underwhelmed, as they are mostly plastic. My next thought was that they must have put all the money in the design and the drivers. But after handling them, they are actually very durable. And I do like the fact that they are handmade in Germany. The quality is actually good, as well as the fit and finish. The cable has a premium feel to it. The earcups fit well over my ears, and are very comfortable as well. There must have been some thought involved with the design, as the earpads are not your typical round design. Steve Miller Band: Swingtown provided really clean cymbals and guitar. The keyboard was also crisp sounding with good resolution. Kick drums had good extension to it. The harmonics were excellent with no noticable coloration. Metallica: Nothing Else Matters showed excellent acoustic guitar that was extremely crisp and clean with lots of resolution. Vocals had good depth and timbre. They were also a bit more balanced with more bass output. Pussycat Dolls: Don't Cha had nice dynamics in the snaps/claps, with excellent resolution in the percussion, and high frequency extension in the triangle. Vocals were clean and well articulated. Bass extension was good with ok authority. Brunson Brothers: Fleace Movae was very clean with excellent resolution and natural sounding trumpets and strings. I loved the excellent harmonics. They were very musical. The bass extension was also ok. Eric Kenzel: Sing, Sing, Sing showed excellent sound and resolution. The clarinet solo was clean with good air, and you could hear the woodiness of the reed. Imaging was really good, with a good sized soundstage. The trumpet solo was really clean as well. The Audio-Technica ATH-ESW9 is part of their top of the line models. They are actually a portable over the ear design. The earcups are smaller, and the headband is made narrower. The earcups swivel, and there are cables at each earcup. MSRP is $350. The quality of materials is excellent. They feature wooden earcups made from African Padauk wood. The earpads and headband are covered in lamb skin. I love the color of the wood, and the plush premium feel of the real lamb skin. These premium headphones scream top of the line. The fit and finish is also excellent. While the earcups are smaller than I typically prefer, they are still very comfortable. The headband is easy to adjust. The swivel mechanism is very smooth, and feels extremely well put together! I absolutely LOVE the quality and feel of these. They are also made in Japan, which is typically a step of three up from other countries when it comes to electronics made on that continent. Steve Miller Band: Swingtown had crisp cymbals and good low end extension in the kick drum, and natural sounding keyboard. Vocals had a pleasant feel with real depth to the timbre. Metallica: Nothing Else Matters had acoustic guitar that was nice and clean with good resolution. Vocals were smooth with energy. The kick drums had nice extension with good control. Pussycat Dolls: Don't Cha had sufficient dynamics in the snaps/claps with excellent resolution in the percussion. The triangle showed good high frequency extension, and the vocals were smooth. They also showed good low end extension and authority. Brunson Brothers: Fleace Movae was very clean with excellent resolution. Every detail of the string instraments came thru, and they were a tad more refined sounding. The trumpets sounded great, and the bass extension was good. Eric Kenzel: Sing, Sing, Sing was great sounding with very good resolution. The clarinet solo was clean with good air. The soundstage was big and deep, with great imaging. The trumpet solo was also really clean. I thinking to myself how musical they sounded. The Audio-Technica ATH-W1000X is also known as the Grandioso. And I can see why. They are gorgeous large over the ears studio style closed back headphone. They incorporate Audio-Technica's wing headband, that makes them feel light on your head. both swivel earcups have cables. The quality from the previous Audio-Technica model continues. It is constructed of wood, aluminum and plastic. And it isn't just any wood. The backs of the earcups are made from virgin North American Dark Cherry. They are polished, and describing them as gorgeous does not do them justice. They are absolutely stunning! The leather earpads and 3D wind support help make them very comfortable to wear. The swivel mechanism is again very smooth. Fit and finish is excellent. The cables are also of premium quality. and the use of the wood is also extended into the 1/4 inch plug. One other thing worth mentioning-it only has a 1/4 inch plug. In other words, these headphones will not work in your iPod. But then again, with the quality and cost of these, I can't see these Grandiosos being used on the go. Although I will admit that I would have liked the option. Steve Miller Band: Swingtown provided excellent resolution, with really crisp cymbals. Harmonics were also excellent, and the kick drum had good low end extension. Vocals were smooth and natural sounding. Metallica: Nothing Else Matters showed extremely clean acoustic guitar, and smooth vocals with nice pitch definition. The kick drum again had good extension and control. I heard things that I had never heard before in this track, thanks to the superb resolution. Pussycat Dolls: Don't Cha had extremely dynamic snaps/claps, and very good resolution in the percussion, with excellent high frequency extension in the triangle. Vocals were natural and clean. Bass had great extension and great authority. Brunson Brothers: Fleace Movae served resolution that was stunning! I have been personal friends with the members of the band for years, and I heard details I had not noticed before. It was really clean with great harmonics and not too brassy in the trumpets. They were very musical, and the bass extension was good and played with authority. Eric Kenzel: Sing, Sing, Sing delivered phenomenal sound and excellent resolution in the clarinet with good air. And you could actually hear the woodiness of the reed. The soundstage was big and deep. There was nice extension and output from the tympani. the trumpet solo was also really clean, with great pitch definition of the trombones. And again, they were extremely musical. 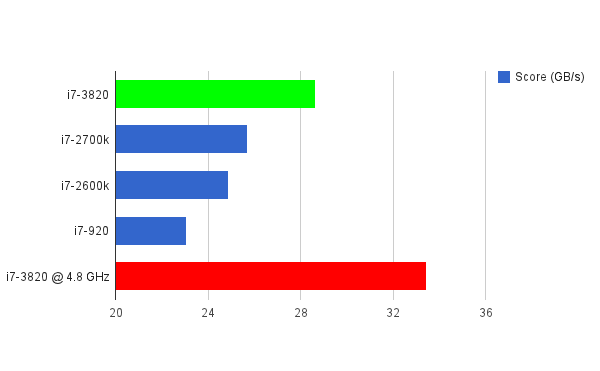 As expected, all of the participants in this years Headphone Shootout performed well. And as expected, the higher priced models performed better. You do get what you pay for, and some of the models like the Audio-Technica ATH-W1000X and German Maestro GMP 435 S sounded amazing. All of the others sounded equally well at their given price points. And in the case of the Audio-Technica ATH-ANC7b, you also get active noise cancellation. Based on their design, features, quality, and performance, the AKG K451 and The House of Marley Stir It Up have earned our Recommended Award. 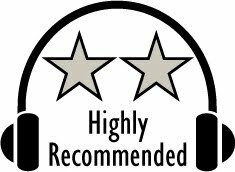 The Audio-Technica ATH-ANC7b, Sennheiser HD 25-1 II Originals, and AKG K550 have earned our Highly Recommended Award. And the German Maestro GMP 435 S, Audio-Technica ATH-ESW9, and Audio-Technica ATH-W1000X have earned our Editor's Choice Award. For more info and complete specs, check out their website at www.akg.com, www.thehouseofmarley.com, www.sennheiser.com, www.german-maestro.de, and www.audio-technica.com. Tablets are getting more and more popular. Up for review today is Nextbooks Premium9 Next9P. It is a 9" color tablet. You can do so much with smartphones these days. The portability is nice, but looking at the small screen can be such an eye strain. Enter the Nextbook Premium9 Next9P tablet. It came well packaged in an attractive looking box, and was well protected. Included were the necessary charger, USB data cable, owners manual and quick start guide. Quality was quite good, as well as fit and finish. The front was an attractive looking screen and black bezel which reminds me of my Galaxy Tab 10.1. At the top is the front facing camera. The back is silver aluminum, with the expansion card slot in the top left corner. On the top left side is the power and volume hard buttons. The right side houses the power, mini USB and headphone jack. At the bottom are the stereo speakers. The Nextbook Premium9 Next9P came preloaded with Android 2.3.1. The color display is quite sharp with good colors. Sensitivity of the touch screen was also just right...not too sensitive or under sensitive. The internal speakers were a tad tinny, but expectedly so for a small device. Navigation through the device and programs was very simple and easy to figure out. There is no rear facing camera, just a front facing camera. You will need to be in a well lit room as there is no built-in light. Resolution was sufficient. The processor speed was sufficient as well when it came to navigating around and playing games and reading books. When it came to going online and browsing the Internet, downloading was sluggish. When compared to my Galaxy Tab 10.1, it was about half as fast. But it worked. All in all, I was well pleased with the performance of the Nextbook Premium9 Next9P. The biggest problem I had with it was the inability to get android marketplace on the device. Instead it has it's own marketplace called SlideMe Marketplace. It has approximately 10,000 apps. While it is a lot of apps, it is just a fraction of the number of apps on Android Marketplace. I was, however with some difficulty, able to download Kindle. So now I have access to my complete eBook library. So while the Nextbook Premium9 Next9P worked great, it also had a few shortcoming. But with an MSRP of $250, it is also a lot cheaper than my Samsung Galaxy Tab 10.1. Based on it's features, design, quality and performance, it has earned our Recommended Award. For more info, check their website at www.nextbookusa.com. As the saying goes, bigger is always better. It can be easy to argue that is not always the case. But in looking at the Kicker 15 inch square Solo-Baric L7 DVC subwoofer for the behemoth it is, I would have to argue that at least in this case...bigger does appear better. And better it does look! With the slogan, "Livin' Loud," Kicker products are built to be able to endure the torture that playing loud can enforce on the products. Yes, they take that slogan seriously, and their quality products uphold it. So naturally, when given the opportunity to review the venerable L7, I jumped on it. I just knew it was going to be build like a tank, something I have grown to expect from Kicker products. varies with enclosure size. See your KICKER dealer for details. The Kicker 15" Solo-Baric L7 came shipped double boxed, so it was well protected. The box was your typical printed packaging with pictures of the product and details opening the box revealed a Goliath of a subwoofer wrapped in plastic and sitting in a fairly solid molded Styrofoam. Taking off the plastic bag showed the quality I was wanting to see. I have seen Kicker Solos before, as well as heard them. I have previously reviewed Kicker RS speaker line. After taking the midrange drivers out of the packaging, I could not help but think that they took some of the design for the cast baskets from their subwoofer line. The baskets were solid, and tough. So when I saw the tank-like build quality of the cast basket, I thought again to myself, Yep, that's Kicker! My only disappointment was that the only items included were the subwoofer, and manual. I would have liked a grill, as the location in my car is right behind my seats. But then again, no one includes grills for subwoofers. Build quality, materials used, and fit and finish were also really incredible. The cast aluminum basked was solid, as was the quality of the hard plastic injection molded SoloKon cone and Santoprene surround that was stitched to it. The cone movement felt stiff, and was a sign that is could handle a lot of power. This same build quality also followed through into the terminals, spiders, and leads stitched into the spiders. I liked the rougher feel of the black aluminum basket. And the magnet was just plain huge! The kicker Solo-Baric L7 really is built like a tank. Fit and finish of the end product was excellent. The manual was also well written, with wiring diagrams, enclosure design options, and specs. The enclosure designs options were for compact and sound quality designs for both sealed and ported. And they provided enclosure measurements and panel sizes for each. With the cost of gas and popularity of compact cars, I went with the compact sealed design and the minimum 2.0 cubic foot enclosure, to see how it would perform. With all speakers, their design, features, and build quality are only good for so much. Speakers including subs aren't designed to just sit there, and we as consumers don't buy them to look good. They need to sound good. After all, playing our music is what it's all about! And if you are serious about your bass, you not only want it to sound good, you also want it to rattle the fillings in your teeth! Next up is the listening tests. It will include all sorts of music, from classical to rock, to pop. And to really try to get the fillings rattling, some bass tracks as well. I have to admit, that when I first started listening to some of my favorite tracks, I thought it sounded good, but was expecting just a tad more. Like with Metallica: Of Wolf and Men. The Kick drum had good impact, and excellent low end extension. And when I listened to Dead Or Alive: Lover Come Back to Me, the bass beats were impactful. When listened to at lower volumes, the bass beats where plenty quick. But when cranking the volume, the huge 15 inch driver was not quite able to keep up. Then I thought that this is really not fair. After all, who is really going to be buying this huge beast of a driver? So I turned to Justin Timberlake: Sexyback. WOW! The bass was not heart pounding, or even chest pounding. It was BODY POUNDING! When given the music this driver was more designed for, it went from slightly above average to stellar! And when I turned to my Techmaster PB's Bass Computer: Activate, and Time To Jam.....HOLY #@%&!!! The volume, sound pressure, and dispersion was just insane! Now this is Kicker! I have come to expect a lot from Kicker. They just perform. And with that being said, I am still impressed. For what it is and at it's $499.95 price point, the Kicker Sub-Baric L7 15" DVC subwoofer is a solid value. It was very clean sounding, played with plenty of authority, and played deep. Not only did its massive motor structure provide high power handling, it was also well controlled and responsive. Only the quickest of beats posed a challenge to reproduce with perfect accuracy. 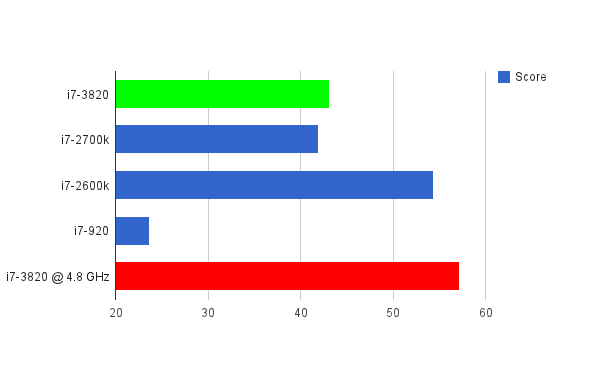 And for a large 15 inch driver, that is only natural, yet the L7 did better than expected for its size. So just keep in mind, that this is a 15 inch driver. It is large, it is efficient, it plays deep, and it is LOUD! It's perfect for street music. If you are after the deep loud bass that can be heard from blocks away, the Kicker Solo-Baric L7 15 inch subwoofer is for you. In the world of subwoofers, there are so many choices. Many manufacturers are trying to get your hard earned money. And in this world of cost cutting, it is easy for manufacturers to rely on its brand name and slump in quality of its products. It is obvious that Kicker expects and only releases products worthy of the name. Kudos to them! Those looking for a subwoofer would slight themselves if they did not include the Kicker Solo-Baric L7 15" DVC in their list to listen to and to consider. Based on its design, features, quality, and performance, the L7 has earned our Editors Choice Award. For more info and complete specs, check out their website at www.kicker.com. Reference gear used included Kenwood Excelon DNX9980HD Multimedia Receiver, Vibe Audio Space 3D 6 inch 3-way component system, Alpine Type-X SPX-17Pro component system, Vibe Audio Stereo Lite 4 Channel Class GH amp, Vibe Audio Black Death Bass 1 Class GH sub amp, AudioControl DQSX 6 Channel Digital Crossover/Equalizer.